Bangkok’s historic Grand Palace district is the place to be right now if you’re in the Thai capital. A small heritage B&B offers old-time charm just a short walk from the city’s grandest spectacle. Thailand is experiencing the most heartbreaking event ever known to Thai people, the passing the world’s longest reigning and most greatly beloved monarch, HM the late King Bhumibol Adyuladej. Since his passing on October 13, 2016, hundreds of thousands of mourners have converged from all parts of the country to the Grand Palace in Bangkok attend the Buddhist funeral rites and say good bye to their late greatly beloved and revered monarch. While the mourning deeply personal for the Thai people, who grew up seeing the good works created by this monarch over his 70-year reign and have never known any other monarch, many foreigners, even those who’ve lived in Thailand for years say they don’t understand the depth of emotional connection that the entire nation feels for their king. Many feel his loss deeply, and not just the loss of a great monarch and a great human being, and the loss of everything good that he stood for, but that definitely his loss marks the end of an era. However, I’ve noticed is that foreigners and tourists as well as citizens want to go to the Grand Palace and pay their respects, and many visitors have made their way to the Grand Palace to lay a bouquet against the palace wall or sign a condolence book, or even volunteer and be part of the historic events taking place in real time. It’s touching for Thais to see foreigners share in the collective emotion. (If I’d been in London at the time, I would have done the same for Princess Diana. I had always liked her and I have to admit I sobbed while watching Elton John sing Goodbye English Rose at her funeral). If you’re visiting Bangkok and want to stay in the historic area around the Grand Palace known as Rattanakosin Island, I know a lovely little old-world B&B that fits right into the old-time character of this cultural heritage district. The Asadang is a tiny little gem of a hotel that was salvaged from derelict ruins and given new life as a cozy bed and breakfast place by an enterprising architect couple who are on a mission to conserve historic architecture. Located a short walk to the Grand Palace and Temple of the Emerald Buddha, the Asadang B&B is steeped in old Bangkok charm. 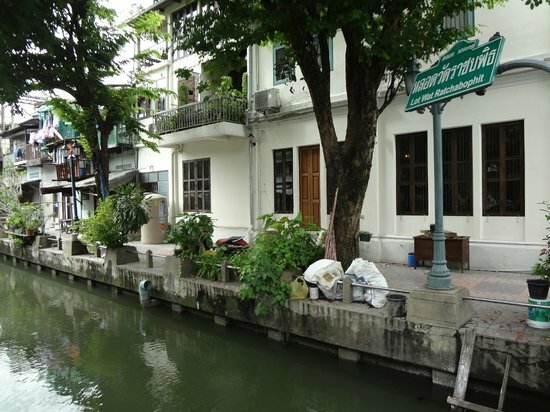 This lchharming old building is perched on a canal on the corner of Soi Phraya Si, a peaceful lane connecting two historic roads, Asadang Road and Fueng Nakorn Road. 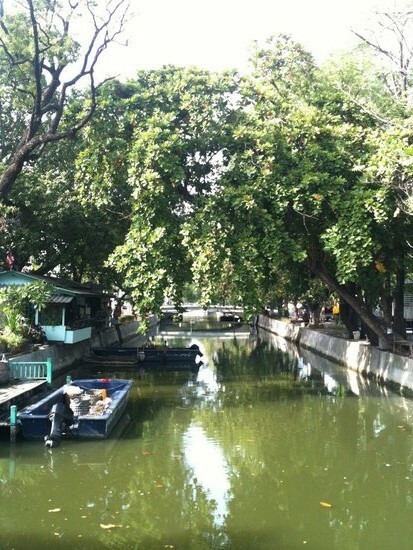 This area is known as a heritage neighborhood of old Bangkok. The Asadang’s most fabulous feature is its amazing location within walking distance from Rattanakosin’s most famous heritage sights – the Grand Palace, Wat Phra Kaew (Temple of the Emerald Buddha, Wat Pho (Temple of Reclining Buddha), the National Museum, the Flower Market, and many more. It’s the perfect location where you can experience authentic old Siam and absorb all the charms of traditional and historic Thai culture – architecture, cuisine, traditional canals, antique shophouses, and majestic palaces, temples, and monuments. “I’ve always loved historic architecture and style. My husband and I restored our first historic B&B in this area, the Buthorn, a few years ago, and when we saw this building we decided to do another one.” says architect owner Chitlada Senghluang, who, for someone who loves historic style, was unexpectedly dressed in very contemporary funky green Zara cargo jeans and a crisp white shirt. “It’s Ike having another child,” she chuckled, “and we love it”. Originally located on the estate of nobleman Praya Si Sahathep, the building was a shop house that was built in the early 1900s and had been a restaurant, then a law office for many years. It had been empty for ten years before the current owners renovated it. The nine guest rooms are furnished with antiques from Chitlada’s own collection. The most picturesque room is the penthouse room, accessed by a spiral staircase with a wow factor private balcony overlooking the canal below and a stunning view of a nearby golden pagoda and temple roofs. With floor-to-ceiling windows facing leafy trees, it’s a fabulous nest where you can take in the sunrise or enjoy a quiet drink at sunset. Breakfast is a choice of either western or Thai breakfast, and if you want an authentic local experience to go with your environment, I recommend the Thai breakfast which is bought from the local vendors and presented in classic Thai pinto food carriers, stacked enamelware that efficiently keeps food in separate compartments with no need for plastic wrappings. You’ll get an array of typical Thai breakfast like batong goh crispy Chinese fried dough, rich and delicious khanom krok coconut cream cakes, rice with chicken or pork, and fresh tropical fruit. The Asadang welcomed its first guest on March 15, 2012 – coincidentally the same day as the birthday of building’s original owner Praya Si Sahathep. It doesn’t make my hair stand on end. To me these kinds of coincidences are impressive rather than creepy. But I do think it falls in the realm of auspicious signs of how we’re all connected to the universe! 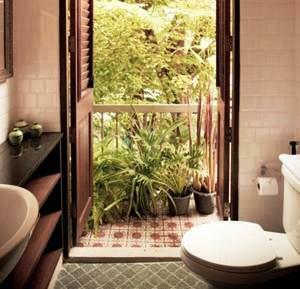 Have you stayed at the Asadang or any other historic B&Bs in Asia? We’d love to hear about your favourite places!